The complete Morocco vacation and culture tour. Experience Morocco’s diversity visiting Fes, Meknes, Volubilis, Dades valley, Marrakesh, Essaouira and the southern Kasbahs and dunes. Email for a detailed itinerary on all the cultural visits we make en-route. We can also extend this tour for you. Your 12 night Morocco vacation culture tour of begins in the imperial cities of Fes and Meknes. Both rich in history and Islamic arts and architecture there’s the world famous medina of Fes with splendidly ancient tanneries, University Al Qaraouine founded 859, and museums: Attarine and Dar Batha Museum historical arts and crafts. Founded in 1438, here also is the location of the world’s oldest Mellah – which means Jewish quarter. Morocco had a sizeable Jewish community up until the 1960’s. 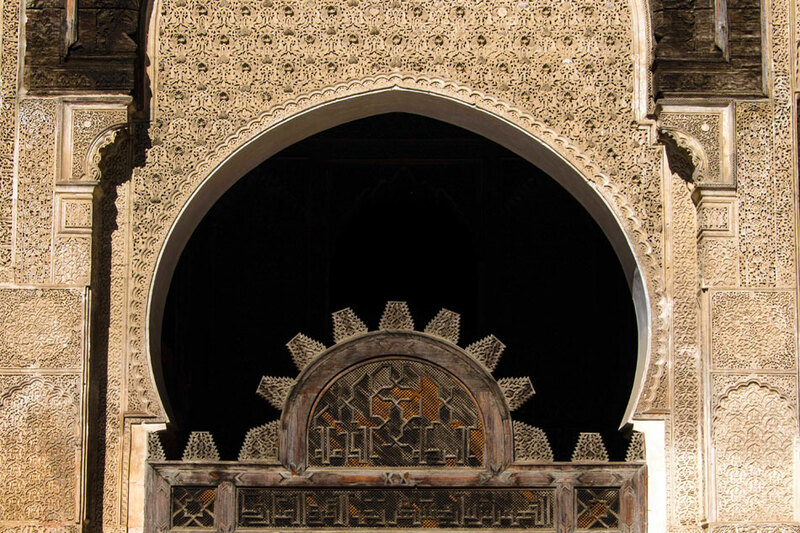 In Meknes you can visit the Bab Mansour gate and beyond the Mausoleum of Mouley Ismail. It’s a short trip to Volubilis, the ancient site of Roman ruins, where you’ll find well preserved original Roman mosaic flooring. Volubilis is remarkable evidence that the Romans were significantly reaching south into North Africa. No Morocco vacation is complete without a trip to the desert. The dunes at Merzouga are our preferred choice. As well as getting a real taste for the Sahara here, camel trekking included, there are also good hotels close to the dunes allowing options for comfort. 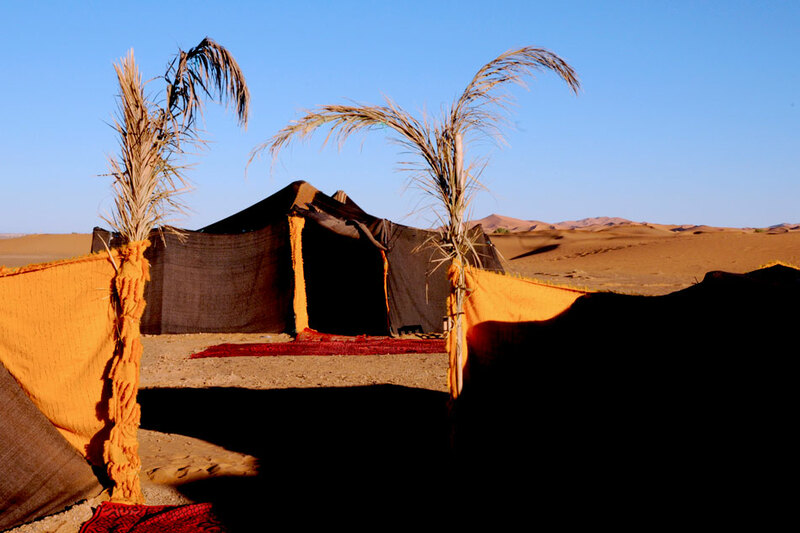 You can also choose to experience an overnight stay in a nomadic style desert camp. The camps typically accommodate a small number of people, usually up to 6 but a private camp is also possible. Nearby Rissani, once on the salt road, the trade route south to West Africa houses the Moulay Ali Cherif Mausoleum, one of the founders of the Alaouite Dynasty of Morocco in the 17th century. Rissani is also a centre for fossils so there’s also the opportunity to go fossil hunting and afterwards visit to the local fossil polisher for your finds to be ready as gifts. Dades valley is magnificent. A lunar landscape on the one side offset by a verdant valley and river course. Its rock forms are extraordinary and the 20km route through the valley is peppered with crumbling Kasbahs – “The valley of a thousand Kasbahs”. Todra Gorge is the highest, narrowest gorge in Morocco and you can experience standing within it’s narrow walls. Although the cultural highlight of the two days spent in this area is in the little known oasis village of Elkhorbat. 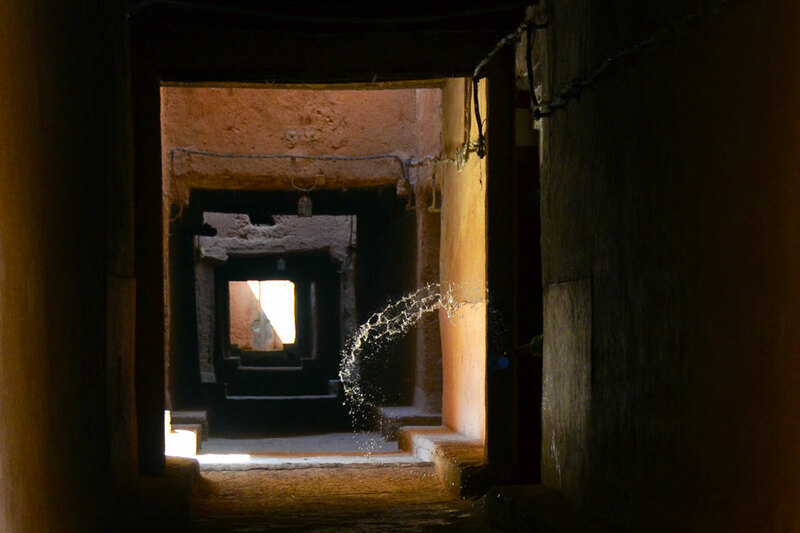 Here families still live within the mud brick walls of a Ksar and its tunnel complex which also hosts an excellent hotel converted from a section of the Ksar. One really gets a feel for traditional living all be it with modern comforts. It’s a welcoming location with a museum and offers a fascinating insight in Ksar life. 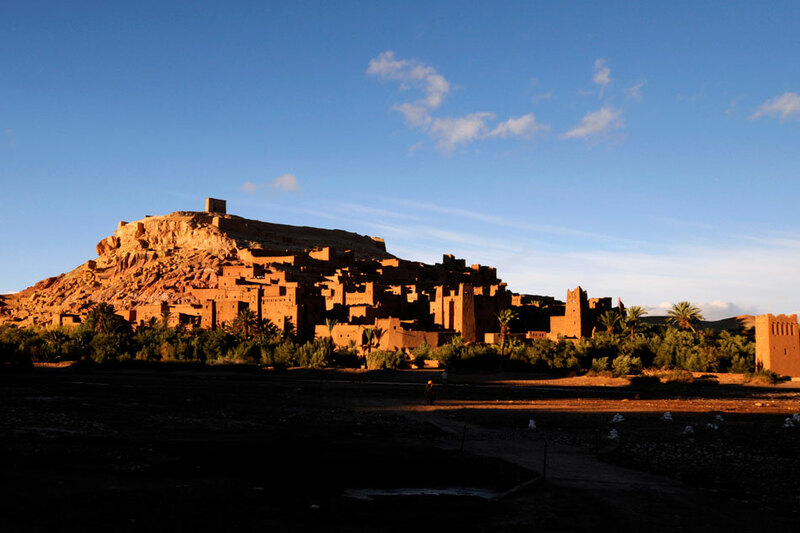 Both Skoura palmearie and Ait benhaddou are UNESCO World heritage sites. Just over an hour from each they are starkly different in terrain but are united by having two of Morocco’s most famous Kasbahs. Kasbah Amerhidil in Skoura and Ait benhaddou itself. There are still 10 families living in houses within the mud brick walls of the village at Ait benhaddou and you can take tea with some of them. Famous as the location for many films, including “The Jewel of the Nile”, the route from Ait north heads through a dramatic landscape of gorges and perched villages to arrive at another famous Kasbah at Telouet. Skoura, was once a playground for Morocco’s elite and you can see the remnants of Kasbahs scattered across the palmearie in view of the High Atlas mountains. 2 nights in Marrakesh gives you the chance to explore all Marrakesh’s historic sites during the day as part of your Morocco vacation. The outlandishly exotic “red city” can essentially be explored on foot including visits to the Saadian tombs, Palace of El Bahia and the Ben Youssef Koranic School. 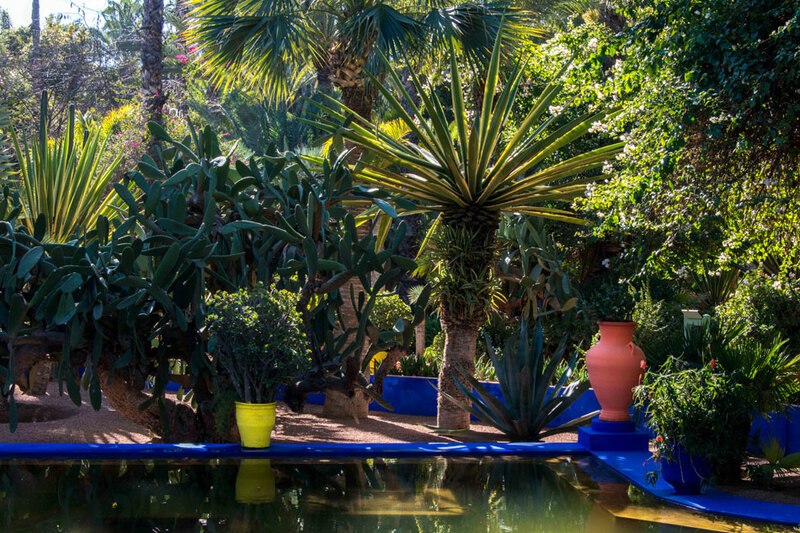 A short taxi journey will take you to Jardin Majorelle which is well worth a visit if you admire havens of gorgeous colour. Aside from historic culture there’s also the opportunity to peruse the extensive souks and haggle with the best of them. The city is blessed with some excellent restaurants. You can even take afternoon tea at La Mamounia, Morocco’s most famous hotel. Prepare for a strict dress code! At dusk the main square comes alive and here you can see the great spectacle of food stalls, performers and the ‘Marrakchi’ enjoying the outdoor life. A great location to end your tour. Essaouira offers a temperate all year climate, easy going people and shopping experiences without hassle. There’s the fabulous working port, fresh fish alfresco and a charming medina to while your time away. 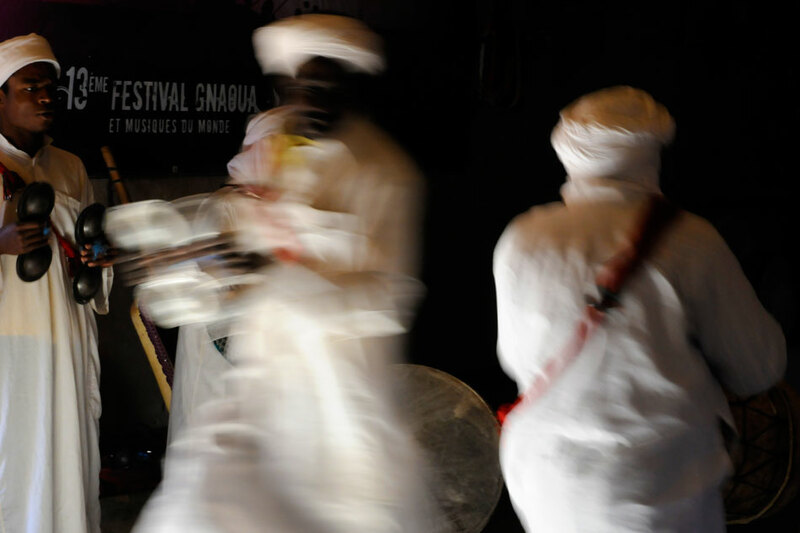 The annual festival of “Gnawa music”, is held in late June. Gnawa heralds from sub-Saharan Africa and has its historical roots in the slave trade. A blues kind of music, it’s influenced many artists including Led Zeppelin and you can catch Gnawa musicians throughout the year. The region of Essaouira is also known for it’s production of Thuya wood and Argan oil now a big international export. There are co-operatives in the town you can visit to watch it’s production. can assist with your Morocco vacation.